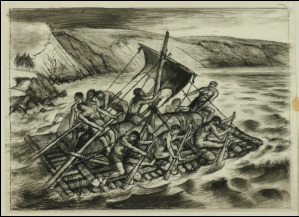 Alan Sorrell RWS (1904-74) is widely remembered as the artist who visualised our archaeological heritage working in close collaboration with the leading archaeologists of the day. 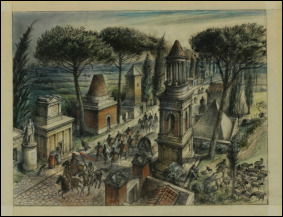 The artist's family generously agreed to lend a selection of illustrations from his books, such as Roman Britain and Imperial Rome to the 2015 Works on Paper Fair Loan Exhibition. 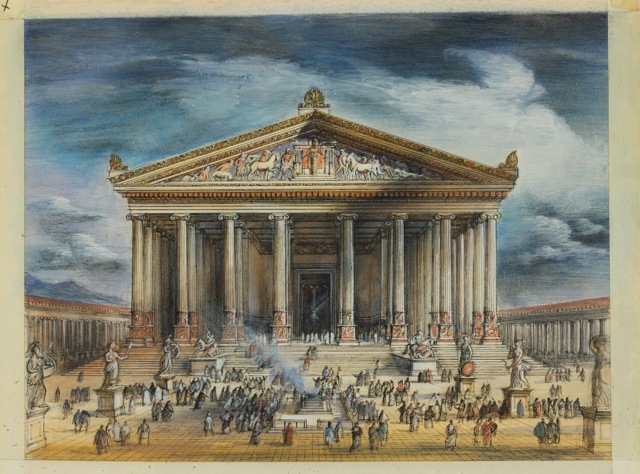 These were not included in the recent Sir John Soane's Museum exhibition, and had never been on public display before. The Loan Exhibition was very popular amongst our visitors; a selection of the images which were on display are shown on this page. 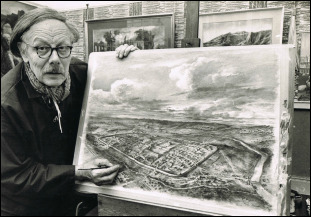 Alan Sorrell c 1971, Photograph, depicting "Reconstruction of Roman Colchester, circa 250". (collection of Colchester and Ipswich Museum Service).